JUGGERNOG MINI-FRIDGE – Store beverages in a fully functional Juggernog themed mini-fridge – modeled after the in-game Perk-a-Cola machine. The Juggernog mini-fridge features light and audio straight from the game. This mini-fridge holds up to (12) 12oz cans ensuring you will always have a cold perk nearby. PERK-A-COLA COASTER SET WITH CUSTOM TIN – Get a set of coasters featuring Juggernog Soda, Revive! Soda, Speed Cola Soda, and Double Tab Root Beer emblems from Call of Duty: Black Ops III Zombies. The set includes a custom tin for storing your coasters. SEASON PASS – The Call of Duty: Black Ops III Season Pass is your access to four exciting DLC packs. LIMITED EDITION SPECIALIST CONCEPT ART CARDS – Call of Duty: Black Ops III multiplayer introduces the new Specialist character system, allowing players to choose from 9 elite black operations soldiers – each with their own look, personality, and voice. Each Specialist is featured on their own art card that includes exclusive concept art, biography, and a description of their unique weapon and ability. THE GIANT BONUS MAP – Zombies returns in all of its undead glory with “The Giant,” a Nazi research facility featuring the weapon-upgrading Pack-a-Punch Machine. Re-live the chaos of Treyarch’s classic “Der Riese” Zombies map, picking up the Zombies story with Dempsey, Nikolai, Richtofen, and Takeo where Origins left off. COLLECTIBLE STEELBOOK – Limited edition steel game case featuring an exclusive design. IN-GAME BONUS CONTENT: BLACK OPS 3 BONUS PACK – Join the battle with the official Black Ops III personalization pack. 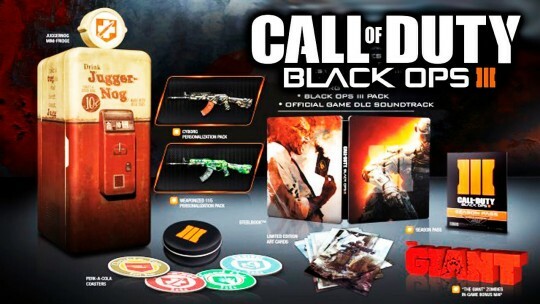 Pack includes a custom weapon camo, reticle, and calling card. IN-GAME BONUS CONTENT: CYBORG – The fan favorite Cyborg Personalization Pack returns in Call of Duty: Black Ops III, fully-loaded with an electrotech-themed weapon skin, uniquely-shaped reticle, and a calling card. OFFICIAL CALL OF DUTY: BLACK OPS III SOUNDTRACK – Upgrade your playlist with a digital copy of the in-game score. This entry was added to the database on Friday, August 7th, 2015 at 7:45 pm by mosavon. This information was last updated on Friday, August 7th, 2015 at 7:52 pm by mosavon. Hello everyone I don't post much on here but didn't see anything about this so I wanted to post it for those interested. Not very good at this, can't even get the pic to work on here so maybe a pro can update this post. 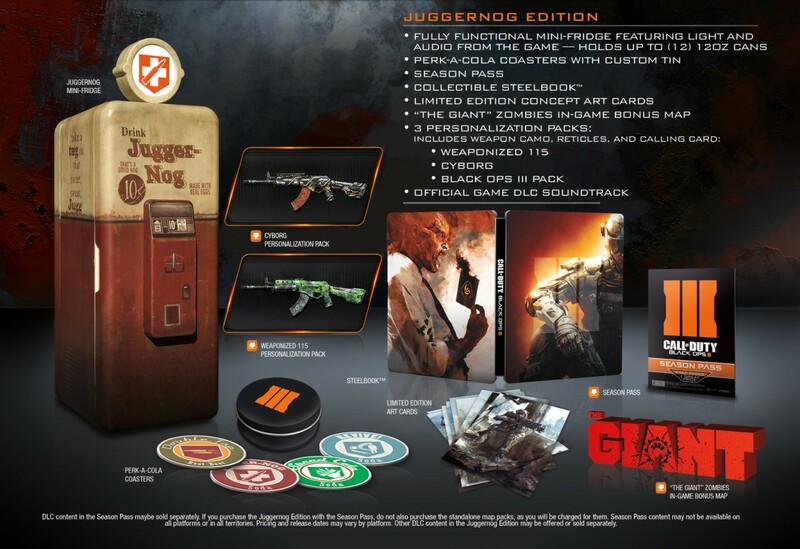 Call of Duty Black Ops 3 Juggernog Edition. Xbox One and Playstation 4. Sorry everyone did a search and it didn't come up but found it under a different forum topic. - JUGGERNOG MINI-FRIDGE – Store beverages in a fully functional Juggernog themed mini-fridge – modeled after the in-game Perk-a-Cola machine. 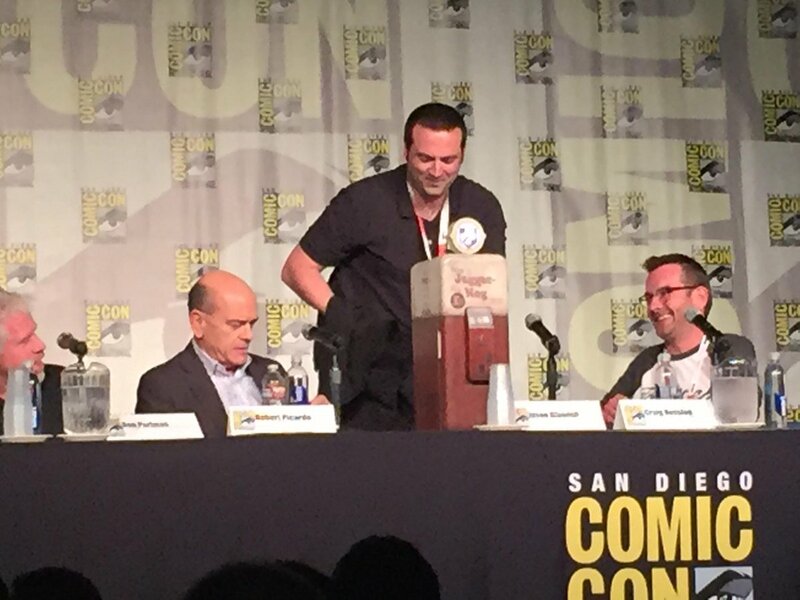 The Juggernog mini-fridge features light and audio straight from the game. This mini-fridge holds up to (12) 12oz cans ensuring you will always have a cold perk nearby. - PERK-A-COLA COASTER SET WITH CUSTOM TIN – Get a set of coasters featuring Juggernog Soda, Revive! Soda, Speed Cola Soda, and Double Tab Root Beer emblems from Call of Duty: Black Ops III Zombies. The set includes a custom tin for storing your coasters. - SEASON PASS – The Call of Duty: Black Ops III Season Pass is your access to four exciting DLC packs. - LIMITED EDITION SPECIALIST CONCEPT ART CARDS – Call of Duty: Black Ops III multiplayer introduces the new Specialist character system, allowing players to choose from 9 elite black operations soldiers – each with their own look, personality, and voice. Each Specialist is featured on their own art card that includes exclusive concept art, biography, and a description of their unique weapon and ability. - THE GIANT BONUS MAP – Zombies returns in all of its undead glory with “The Giant,” a Nazi research facility featuring the weapon-upgrading Pack-a-Punch Machine. Re-live the chaos of Treyarch’s classic “Der Riese” Zombies map, picking up the Zombies story with Dempsey, Nikolai, Richtofen, and Takeo where Origins left off. - COLLECTIBLE STEELBOOK – Limited edition steel game case featuring an exclusive design. - OFFICIAL CALL OF DUTY: BLACK OPS III SOUNDTRACK – Upgrade your playlist with a digital copy of the in-game score. - IN-GAME BONUS CONTENT: WEAPONIZED 115 – The Weaponized 115 Personalization Pack brings the popular Zombies theme to your favorite Multiplayer weapon. Customize your weapons with the fan favorite Origins-inspired camo, reticle, and animated calling card. - IN-GAME BONUS CONTENT: CYBORG – The fan favorite Cyborg Personalization Pack returns in Call of Duty: Black Ops III, fully-loaded with an electrotech-themed weapon skin, uniquely-shaped reticle, and a calling card. - IN-GAME BONUS CONTENT: BLACK OPS 3 BONUS PACK – Join the battle with the official Black Ops III personalization pack. Pack includes a custom weapon camo, reticle, and calling card. I guess it will be 300 dollarz or more. This is getting ridiculous. Thanks for posting Mac! I was just too lazy to create a "new addition" thread so I posted it in the "random thoughts" thread. Appreciate your efforts though! Also, yeah, was already available for preorder at Mightyape yesterday. I believe it was like $289 or something like that (and probably in AUD). Shipping would likely kill it though. It appears to either have been taken down or sold out now though. Also GS in the USA announced a "hardened edition" yesterday that looks exactly like this sans mini-fridge. It's already sold out on Amazon.com Gamestop.com, and Bestbuy.com, both Xbox One and PS4. They were available for pre order yesterday. You should see some of the ridiculous prices on eBay already! It seems they are still available on GAME UK, but it won't accept my card for Some reason.. Already sold out. I just preordered mine at gamestop. They were alloted only 1 preorder each for xbox one and ps4. You pre-ordered it at Gamestop or online? How much did you have to put down?